As part of a larger project to educate a multinational offshore team of web developers and business analysts I was asked to define and document the company’s Sharepoint Style Guidelines. However, after initial interviews resulting in personas and user stories it was realised publishing standards alone would not result in a behaviour change (more usable, compliant, consistent, Sharepoint Sites). The time challenged target audience need basic usability, graphic design and company branding training. In addition this had to be self-service and simple to understand. Having created a very detailed Sharepoint Style Guidelines Intranet reference site and document (for external agencies) I determined it should be possible to summarise the main points into a simple infographic that explained in simple terms what every developer and BA should know but could be read in less than 10 mins. Various concepts were tried. Each with different merits but none particularly memorable. So I proposed instead we use a memorable acronym (BUGS HALTED) and constantly refer to this in all our communications. If we could get our target audience to remember “BUGS HALTED” then all we have to do is associate each letter with a concept. I proposed the easiest way to do this is with an infographic. This was very positively received by all stakeholders, site-owners and our target audience: developers and BAs worldwide. 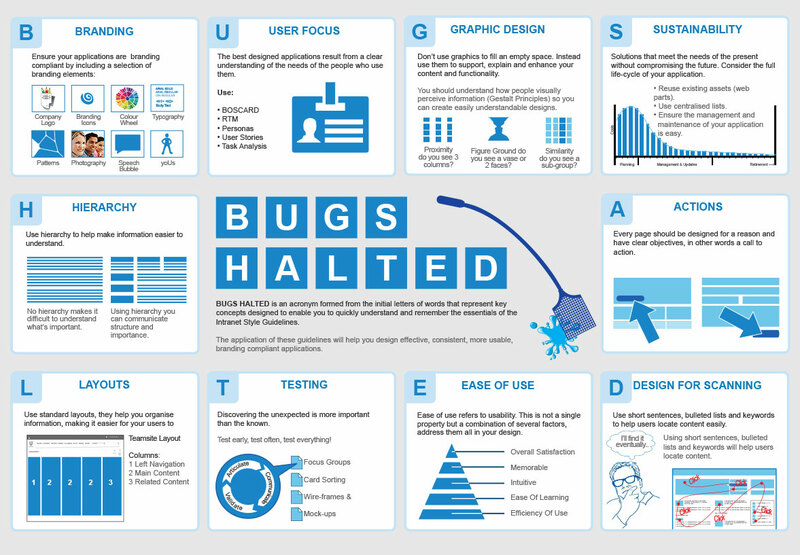 Many functions frequently refer to the “BUGS HALTED” info graphic and it’s common to see this printed as posters in offices. The concept was further refined so that new Sharepoint Sites could be measured and scored against each letter of the acronym. For the first time the company had a quantitive repeatable method for measuring the quality of designs produced internally and external by digital agencies.